The company’s database containing email addresses, gained through web forms, has always been an email marketer’s greatest asset. Many marketers are re-learning that lesson in the wake of GDPR implementation in May 2018. Here’s the problem: The web forms themselves are the marketer’s biggest hurdle to acquisition. What’s the answer? Marketers won’t win the acquisition battle until they control everything about the opt-in form from its design to its locations, beginning with the homepage and extending throughout the site and beyond it. That will take a strong persuasion argument grounded in showing the value of email to the organization. Almost every consumer brand has an email opt-in form somewhere on its homepage. That’s the good news. The bad news is that location is hard to find or fails to promote the benefits of opting in (or both). In fact, 87% of the consumer brands in a Holistic Email Marketing study put the opt-in form in the bottom half of the website, most times, cramming the opt-in down in the tiny type in the website’s footer along administrative and contact links, instead of placing it at or near the top of the page. The opt-in form doesn’t win the fierce battle for prime visual exposure on the homepage because the email team generally doesn’t get to decide where it goes. That happens when email marketers don’t have the influence. Or, they haven’t effectively shown the web team and executives how email drives revenue and engagement and thus deserves the hot spot. So, the web team, which owns page design and functions, gets to decide. But, the web team isn’t rewarded for driving email growth. Result: Web forms go wherever they fit in with the design, not necessarily where they will attract the most attention and drive the most conversions. Homepages sell email short: Our research found email opt-in forms mostly in the middle of the side rails or down in the footer. This tells new visitors, “Email isn’t important in our company.” If it’s not important to the company, customers won’t value it, either. Mainly, it has helped brands understand how valuable up-to-date, permission-backed emails are to the company’s health. 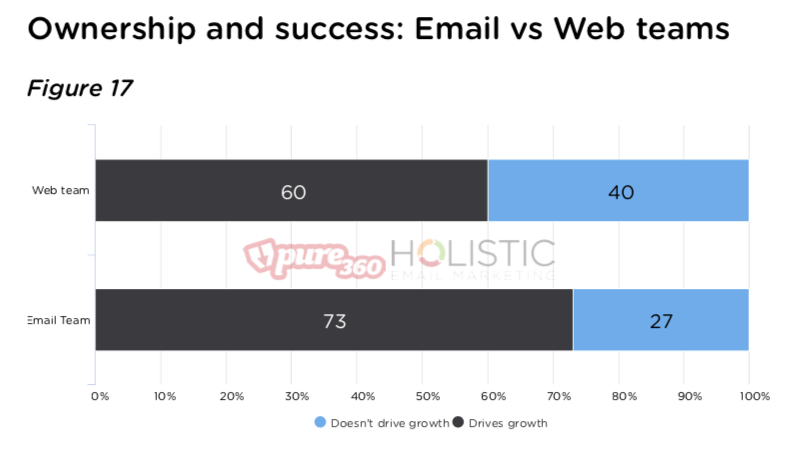 Web forms generate 72% of all database signups, according to Holistic Email Marketing’s newest report, “Email Marketing Personalisation.” However, only 50% of the email teams responsible for those forms have input into those forms. The remaining ownership is spread out among web, content/product, ecommerce and other groups. We also learned that 24% of web teams owned database web forms exclusively, and the same percentage of email teams – 24% – claimed exclusive ownership. Email teams shut out: If 24% of web teams own the forms that generate signups to the marketing database, that means 24% of email teams at those companies have no controlover that primary email-address collector tool. Yet, the email team is rewarded or penalized based on those signups. Not the web team. That’s why the email team must lead the way on optimizing web forms to increase opt-ins. The numbers justify any effort to boost opt-ins through visibility (seeing the form), value (benefits of email) and velocity (a friction-free process). How it pays off: Here’s where all of my arguments for giving the email team ownership over marketing web forms come together. Assume that your conversion rate from opt-in to first purchase is 34% (a rate I see among my clients), and your average order value is $50. Look what happens when you grow your monthly opt-ins just by moving your web form from the lower half of your site’s homepage to the upper half. Below, we’ve included some conservative growth percentages to demonstrate the potential additional revenue. Need more persuasion? Here’s one more argument: Customers who are email subscribers are more valuable to your company than customers who don’t get your message (like people who buy after finding your brand via search, word of mouth, social media or other sources). The brand’s website is a cooperative effort. Email, web, product and ecommerce teams all have something to gain and something to lose when their needs are ignored or minimized. As an email marketer, you owe it to yourself, your team and your email program to make a persuasive case for getting a seat at the table. Use the numbers I’ve shared with you here, and find out what your own company generates from email. Great post Kath. I think when it comes to email marketing, the team should definitely be part of the decision-making process because they are the ones actually involved in the doing.